It’s May. The sun is shining, the flowers are blooming, and, in San Joaquin County, wheels are spinning. 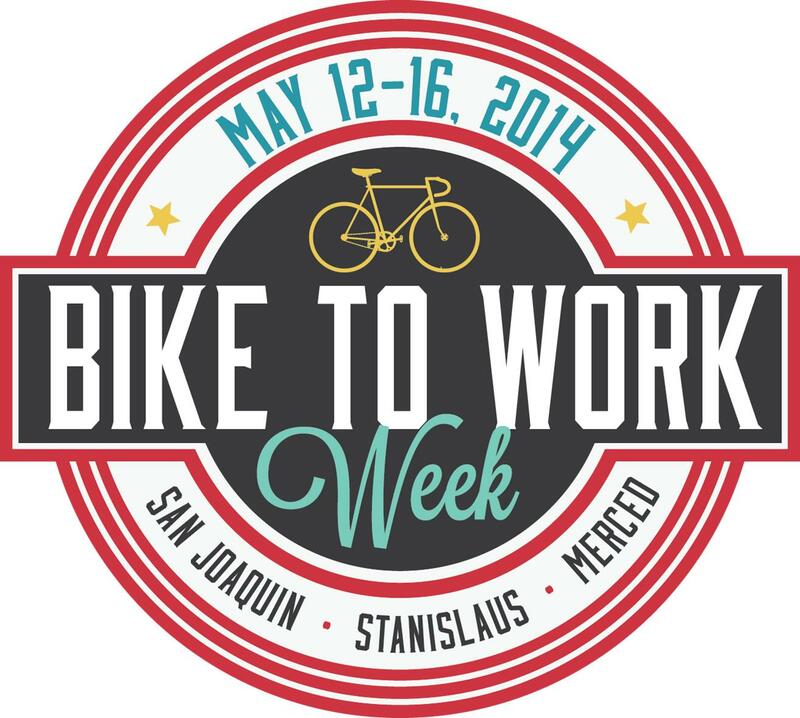 Today marks the first official day of the county’s Bike to Work Week, part of the larger national Bike Month celebrated by cities throughout the country which – perhaps surprisingly – Stockton has been participating in for years. But if you don’t regularly get out and about on two wheels, you might not have known about the annual event happening this Wednesday, May 14, from 6:30 a.m. to 8:30 a.m. at Downtown Stockton’s Janet Leigh Plaza. Bike to Work Week is about emphasizing the use of a bicycle for simple, everyday trips. Cycling in Stockton should not be difficult. The city’s terrain is flat, and for most of the year the climate is mild enough to get around comfortably. Yet only about one percent of the city’s 300,000 plus population regularly get on a bike to do anything oriented around everyday life besides recreate. So, what’s the impediment? Partially, the built environment is not constructed to favor any mode of transportation smaller than the personal automobile. The scale of Stockton’s main streets are vast, and while they move cars efficiently, they discourage those who might want to ride a mile or two to the grocery store and back. It’s a reinforcing feedback loop: Those who are used to getting around town by car are used to driving the most efficient car routes – large streets like Pacific Avenue or Hammer Lane – but these are streets explicitly designed for motorized vehicles, not bicycles. Occasionally you’ll see a striped lane thrown down besides these already bustling streets, but rarely do you see a cyclist riding alongside 40 mph traffic. More often than not they take to the sidewalk, where they feel safe. Additionally, besides a lack of on-the-road infrastructure, Stockton offers very little in the way of bike parking once you actually arrive at your destination. With no place to securely store your bike while you run errands, it’s probable you’d opt for the car instead. That’s where the San Joaquin Bike Coalition comes in. 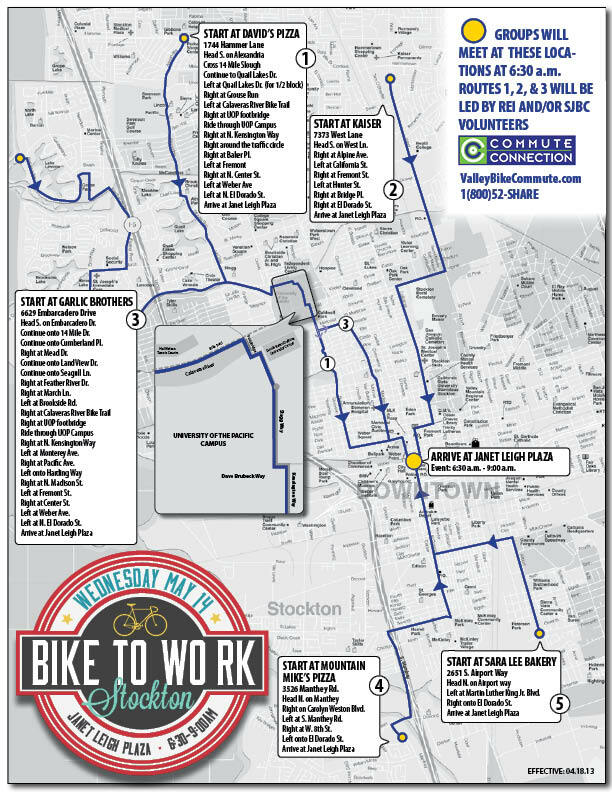 Part of the coalition’s mission is to help local cyclists learn how to get around their city in a safe and efficient manner and Stockton’s annual Bike to Work Day is a great place to start if you work downtown. Starting at 6:30 a.m. riders from all over Stockton can meet at designated points throughout the city where a local ride leader will lead the group toward downtown along the safest routes possible. Commuters are welcome to travel on their own as well, but for first-timers or those who’d like to share in Bike to Work Day camaraderie, you can find meet up spots here. The ride culminates at Janet-Leigh Plaza where riders can get their bikes checked out by an REI Master Bike Technician, chat with the coalition about their experience, and learn more about the different commute options within the city and the broader county. Participants will also enjoy being connected with a growing network and movement of people who are looking for alternatives to being stuck in a car each morning and evening as they go from home to work and back. Yes, yes and yes! Thanks Kristine for the great write-up. I rode my bike in to work today, and I can’t wait to see everyone riding this week and on Wednesday.